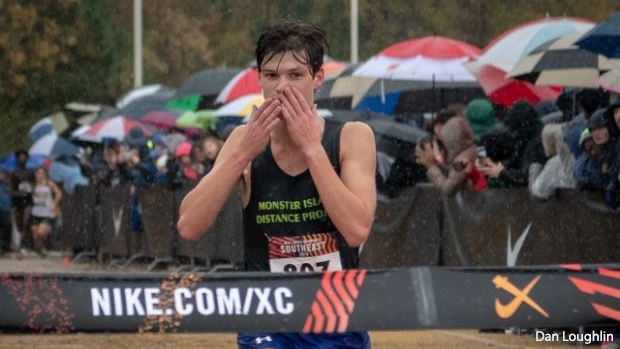 It's safe to say the race conditions for NXRSE and Foot Locker South were less than ideal, for the Floridans that ran either meets, each athlete showed strength and perseverance as they raced with the conditions they were presented with. Florida #1, Charles Hicks, took the win in the Championship race with a 15:04 finish on the muddy WakeMed course. The Bolles senior ran 14:59 on the course at Great American and battled with Loudon Valley's Sam Affolder for the majority of the race. Ben Foltz followed Hicks with his 12th place 15:32 performance, then Alex Hastings in 36th place 15:54, Chase Rivera 15:56, Kamren Khan 16:10, William Brady 16:24, and Cole Rutkowski 17:00. Bolles placed second to the best ranked team in the nation, Loudon Valley (The Jungle). With a total of 117 points, these bulldogs have secured yet another NXN spot. Miami X (Belen Jesuit) had a fantastic race as well, running their way to a hard fought fifth place finish. Belen was led by Adam Magoulas with his 13th place, 15:34, performance with 3A state champion, Javier Vento, following in 15:56. Many Florida athletes had very strong seasons to wrap up their cross country seasons. Among the top Floridians to finish were Aidan O'Gorman (15:47), Justin Wilson (15:55), Giancarlo Benitez (16:22), Diego Gomez (16:24), and Gabriel Montague (16:33). Christopher Wilhelm, out of Trinity Prep, was the first Floridian to cross the line in the boys Invitational race. Wilhelm finished 28th in the combined invitational results with a time of 16:37. Michael Sanchez, out of Miami X (Belen Jesuit), won the boys Rising Star race and kicked the meet off with a Florida win. Sanchez 16:40.10 performance was a huge PR for the Belen sophomore who did not race for the team in Regionals or States. His time puts him in the top 20 Florida boys to compete at NXRSE overall.